The presence of the Pomo people in this area dates back thousands of years. Their traditions included respect for their surroundings and the plants and animals that inhabited them. These hunters and gatherers lived by the seasons, shaping their territories to fit their needs. Their stewardship included pruning, burning off underbrush, planting grasses to attract game, and harvesting in a manner that ensured healthy new growth. The Pomo’s harmony with their surroundings was brought to an end with the arrival of new settlers, who saw the native people as a ready labor force. After depleting the area’s natural resources, these settlers laid claim to Pomo lands and put the people to work. The Pomo attempted to resist these losses, but hard labor, clashes with settlers, and diseases to which they had no immunity decimated their numbers. Today, Pomo descendants occupy a small portion of their ancestral lands, and they are reviving their language and traditions to pass on to their children. Joshua P. Hendy vowed never to allow his ancient redwoods to be cut down, and he was as good as his word. Born in England in 1822, Hendy came to California in September 1849. However, he was not interested in finding gold. His practical approach was to get to know the area well enough to provide what his neighbors needed. Since construction materials were in demand, Hendy’s first venture was a redwood lumber mill; he bought timbered acreage, including the ancient groves in the area of today’s park. Soon after, Hendy had a string of highly successful lumber mills. Hendy then observed that gold mining was progressing from hand tools to more complex methods of extracting gold. In 1856 he founded the Joshua Hendy Iron Works and manufactured mining equipment, some of which is still in use today. Hendy grew to love his home in the Anderson Valley, and he was determined that his beloved nearby virgin groves be preserved. Though large stands of redwoods surrounding Hendy’s groves were logged after his death, Big Hendy and Little Hendy groves were spared for the enjoyment and wonder of future generations. After Joshua P. Hendy died, the groves were sold. Timber was cut and removed from the surrounding forest, but never from the groves themselves. Encouraged by local advocates and Save the Redwoods League, the State Legislature bought the original 586 acres that became this park in August of 1958. Hendy Woods State Park was named and classified in 1963; through League donations and other purchases, the park has since grown to 816 acres. During the 1960s and 1970s, a Russian World War II veteran named Petrov "Petro" Zailenko (AKA Pitro Zalenko) lived among the redwoods adjacent to the park. He became known as the "Hendy Hermit." 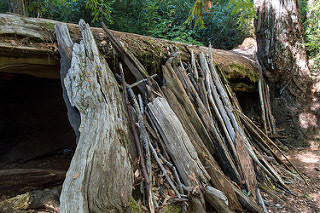 The hermit sheltered in burned-out tree hollows ("goose pens"), lived on what he could scavenge, and wore found clothing. Reputed to be quick and adept at disappearing, Petro lived near Hendy Woods for close to two decades. He died in 1981; the areas he frequented have since been added to park boundaries through purchases and donations from Save the Redwoods League.